There is an interesting historical pattern that has been repeated any number of times across the centuries. A group of the dispossessed and the poor come together within a religious movement. What begins with great enthusiasm succeeds. As it succeeds, those who were once poor and dispossessed manage to gather themselves into some sort of order. They learn to work hard, to avoid disaster, to become better, more moral people. Often this change takes place as those within the community sacrifice to make the same transition possible for others. And then success takes over. Those who once were poor are now prosperous. Association with the poor now feels risky, almost a step backwards. The rewards of morality create a new class of Christians who feel distinctly uncomfortable around the very sort of people who once constituted their membership. In economic terms, it is a movement from poverty towards some form of propertied stability. With the new stability comes a whole new worldview. The shift in worldview is significant. Morality (good behavior) has a way of self-justification. The morally competent all-too-frequently see themselves as the products of their own self-discipline and inner character. They fail to see that they are doing little more than conforming to the social morality of their class. I was born to the middle class (lower). Along with that came a deep sense of right and wrong, of work and responsibility. My parents came from poor circumstances – my father was the son of a sharecropper, my mother, the daughter of a farmer (100 acres). We had little to mark us out as “middle class.” What I actually received was a deeply internalized sense that the middle class was where we belonged. My mother would occasionally inveigh a shameful imprecation on us. Words or actions would bring this ringing rebuke: “They will think you’re some of Uncle Pick’s people!” I never knew who “Uncle Pick” was, or what his people had done. However, it sounded like the worst possible thing. As an adult, I eventually queried my mother, expecting to hear the tale of some terrible faux pas, an out-of-wedlock child or such. Instead, I heard something very different. “They never wanted to better themselves.” This was her dismissal of these ne’er-do-well scions of our family tree. It didn’t matter how poor you were so long as you didn’t act like it. Indeed, being middle class requires a consciousness of not being something else. I have never suggested that anyone should be immoral or amoral. Readers here will know that my commitment to the Church’s teaching is unequivocal. However, I share the concern found in Christ’s approach to the Pharisees. The nature of sin can be easily overlooked in a “merely” moral approach to the Christian life. The “dead men’s bones” that lie beneath the moral surface were obvious to Christ. “We do not have a legal problem,” I have written, “We have a death problem.” “Dead men’s bones” are the result of the ontological corruption that is the very heart of sin. And the deepest and most corrupt sinners among us can also appear to be the most moral. If the morality of your life does not reach beneath the surface and into the depths of the corruption that is at work there, then your life is indeed an expression of moral futility. An equally great tragedy rises from this untended inner corruption. The assurance of moral rectitude is fortified by the unwillingness to rightly acknowledge and bear the inward shame of sin. This dries up the well of compassion that should mark the soul. A gulf grows between the “morally” competent and those who are clearly and visibly broken by sin. True compassion would require the recognition of a kinship of shame. A particular point in the criticisms I’ve received is worth noting. Some have said that I teach that there is no moral progress in this life – that we cannot get better. That is close to something that I have indeed said. I should acknowledge that this a hyperbole on my part. Obviously, the saints are living examples of people who have gone from the worst to the greatest. It is possible to imagine that others can do something similar. I have observed (and said) that it is rare. What is common, I think, is an improvement of behavior, a greater conformity to rules (and this is not a bad thing). But it just as often leaves unattended the “dead men’s bones” of ontological corruption and shame. If, for example, anger is a common element in your life, then it is pretty much the case that there are areas of unattended shame. It is also true that these same wounds will continue to provide the fuel for a host of sins across a lifetime. One thing that separates the traditional middle class in our culture from the lower classes is the adherence to a standard of public behavior. Those in the poorer classes are more likely to misbehave publicly in an embarrassing manner (yelling, cursing, etc.). But the nice banker walking down the street is no less angry. His anger remains unexpressed (except at home in more private places). We can say that the banker is more “moral” than the poor man, but he is just as sick and broken. My writing has an intention of addressing this hidden brokenness. There are already plenty of people who write and pontificate about what constitutes morally correct behavior. I want to attend to what actually causes the corruption in our life. When you strip away the veneer of public morality, you reveal a world of moral futility. If anyone doubts this to be the case I beg them to pay attention to the world in which they live. The chaos and evil that we see belongs to hearts that are just like mine and yours. If everyone in the world were as good as me, then, I fear, we would see nothing that we do not already see. It is only when the veneer is peeled back and we dare to peer into the depths of shame that the Light can begin to overcome the darkness. The darkness cannot be managed – what it hides must be transformed. This deep inner world is the furnace in which the holiness of saints is forged. It is the place of true repentance. In the meantime – and here I must be emphatic – we must be kind and gentle and exceedingly patient with one another. The true spiritual battle in the depths of the soul cannot be forced or browbeat into existence. It requires a trusting confidence and divine empathy to enter such a place. My writing, in its efforts to reveal our moral futility, is undertaken to create for many, a faith that it is possible to find grace and forgiveness with God and support in the struggle towards salvation. God is not our enemy. He entered the depths of hell (moral futility writ large) to free us. He came so that no darkness would be immune to His light. I suspect that anyone who has “stared into the abyss” (to use the Elder Sophrony’s words) would not lightly inveigh on the benefits of morality. My mother worried that we would be taken for “Uncle Pick’s People.” I suspect that it is only when we see that we are all “Uncle Pick’s People” that the light of Christ can work the transfiguration that is the life of grace. We can grow and we can change. But the change is constituted by becoming light, not by becoming well-behaved darkness. Note: I do not expect this article to change the assessment of my work. Beautiful, and so true. Thank you. I remember your earlier articles on morality. One phrase particularly remained with me, to which you allude in this article. “Christ did not come to make bad men good, but to make dead men, live.” This cuts to the core of the ontological problem, which cannot be glossed over with good behavior, but requires transformed hearts. I have vivid memories of going with my mother to bring food to the less fortunate who attended our church. This was in the early 50’s. They lived in tents in a small camp on the outskirts of town. Not that our church was middle class. It was composed mostly of working class folks. The Church itself was an old WWII barracks on stilts. It boasted a wood stove for winter warmth. Yet the children and grandchildren of these same tent dwellers are now solidly middle class with middle class morality. I and our children are some of these (perhaps not having lived in tents but in little 700 foot wood frame homes). And I’m afraid that I am guilty of looking askance now at street people or those of the lower class. It does show the sin that still resides in my soul. Yep, I know I’ve said to myself at times, “If only those people had more initiative, if they weren’t so much like Uncle Pick’s people!” However, if I stop there I am lost. I must go on to exclaim with the apostle, “But thanks be to God who delivers us through Jesus Christ our Lord!” Yes, Lord have mercy. If everyone in the world were as good as me, then, I fear, we would see nothing that we do not already see….T he darkness cannot be managed – what it hides must be transformed. May God’s grace upon you Fr.! My reaction to this message was “I love you”! Yet I don’t know you..except to say that you struck a nerve so deep that God has been working on in me. Thanks for bringing the darkness into the light. Having grown up as middle to upper-middle class, I confess the besetting sin of my life is exactly the temptation of (and frequent fall into) the hypocrisy of what you describe. One of my grandmother’s favorite expression of disapproval was “Shame on you!” (most often directed at one of her dogs who had messed on the carpet!). On the rare occasion it was directed at me for one of my youthful transgressions, it made me long for the earth to swallow me whole! The anxiety of one of my parents about “What will the neighbor’s think?” fed my own anxiety that too often for me overshadowed the truly important matter of what does God think? As I would put it, I have a continuous and wretched temptation to try to appear more righteous (spiritually whole) than I actually am because I fear the social rejection and disapprobation by my peers and superiors. My anger (which I rarely show outside the inner circle of my most intimate family) betrays me every day. I have confessed these (along with many other things on more than one occasion to my Priest/s), but “bearing a little shame” is a struggle every day. The one saving grace in my life is the vision I was given from a young age (as sheer gift from above) of the unspeakable beauty of the depths of Christ’s love and humility and the powerful attraction these have always retained for me throughout the vicissitudes of my most sinful life. (For this reason, from the time I first saw it the year I entered the Church, “The Bridegroom” Icon has rent my heart and remains the one that speaks to me most eloquently of this Depth.) This is the Grace that draws my unworthy and frequently distracted heart again and again to the contemplation of Christ and His Saints, and in that vision alone I have hope. Having reached my “golden years”, I have finally mostly abandoned hope in my own moral performance, though I confess I can still be powerfully tempted to use the illusion I can sustain as a shield for my fragile and infirm heart–especially around those inclined to be liberal with their expressions of disapprobation. (At least, I know it for the illusion it is.) It helps tremendously to seek out the humble with whom I can begin to expose my wounds that they might be healed. Just in the last few days, I have been rereading Everyday Saints. The chapter on Fr. Melchisedek is one of those that moves me the most. Thank you Father. As I was reading this it brought to mind a discussion I had some time ago with a friend. He claimed that because he was saved, he no longer sinned. I once was taught that and yet something in me knew better. I do not believe I was successful in convincing my friend he was not as good as he thought he was. I tried to ask him how he fulfilled the first and greatest commandment. He had no answer and neither do I. I know well and good what it says in Deuteronomy about talking of the Lord when rising up and lying down and when passing along in the way. I also know I am to bear His Law on my wrists and forehead and more importantly I am to do His will not mine. I know I am not always living like this and that I am the first among sinners because of it. I do not do anything overtly wrong, but I am not nearly as focused on Him as fulfilling that First and Greatest Commandment calls for. Thank you for reminding me that there are yet many dead men’s bones within me. I find the most important and pressing concern in my spiritual life is the recognition of my own sin. I am constantly reminded that it is I who sit on the throne of my heart and not the Lord Jesus Christ as it should be. Your article brings me comfort and a more potent desire to to delve into the depths of my sin in order to bring the light of Christ into my heart. Yes, I think this phrase pretty much sums up your work here and also the essence of Christian asketism. When asketism becomes moralism the fall into phariseism is as good as accomplished and the ontological transformation which is Resurrection is mistaken with being a good, well-behaved citizen. I have been reading your blog now for at least four years and I have never taken what you have said to mean that moral behavior is unimportant or that we should live immoral or ammoral lives. What I have heard is your insistence on the fact that moral behavior, when divorced from our true focus and goal – transformation and union with God – in and through Christ Jesus, very quickly slips into becoming whitewash and self-justification. That is why Jesus told the Pharisees that Prostitutes and Tax Collectors would be entering the Kingdon of Heaven before them. That is exactly the point of the parable of the publican and the tax collector. I think that this is the very issue that Victor Hugo, in his stories Les Miserables and the Hunchback of Notre Dame is dealing with. Javert’s morality is the morality of someone who follows all the rules and has become so self justified that there is no longer any room for mercy or forgiveness for others or, as his suicide attest, for himself. I would hope your critics on this issue take pause to truly ponder what you are saying… and what exactly they are saying. I echo Sophia and David. Please don’t ever stop writing. Your words always strike at the depths of my heart and offer much to ponder. David Kontur, very well said! Thank you! I believe you speak for a lot of us regular readers. Every day we pray for illumination. Naturally, I want to receive light to show the world how good I am as a moral, middle class citizen, but the light rather exposes me to be wretched, miserable, poor, blind, and naked. As like your articles, the pictures you post at their headings are usually quite exceptional! This one definitely falls into that category. 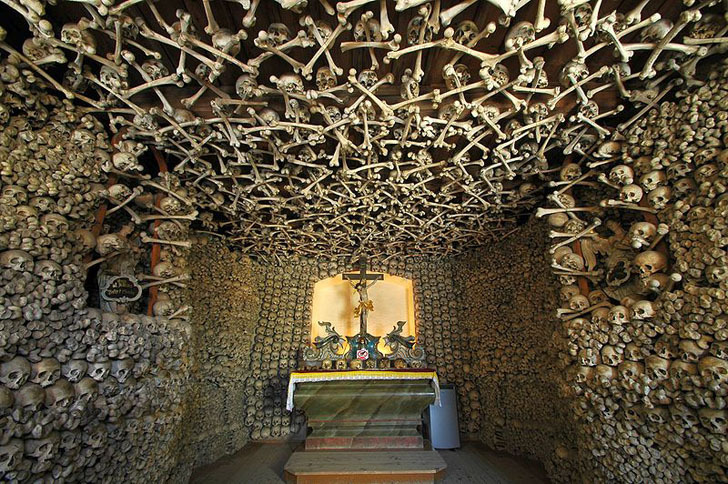 With some research I found it is called “The Chapel of Skulls”. The wiki article says “The chapel was built in 1776 by the Czech-born local parish priest Wacław Tomaszek. It is the mass grave of people who died during the Thirty Years’ War (1618–1648), three Silesian Wars (1740–1763), as well as of people who died because of cholera epidemics, plague, syphilis and hunger… there are also bones of another 21 thousand people interred in the basement…The skulls of people who built the chapel, including father Tomaszek, were placed in the center of the building and on the altar…. with a Latin inscription that reads “Arise from the Dead” . Lord God, may our dead bones become alive by your glorious Resurrection! 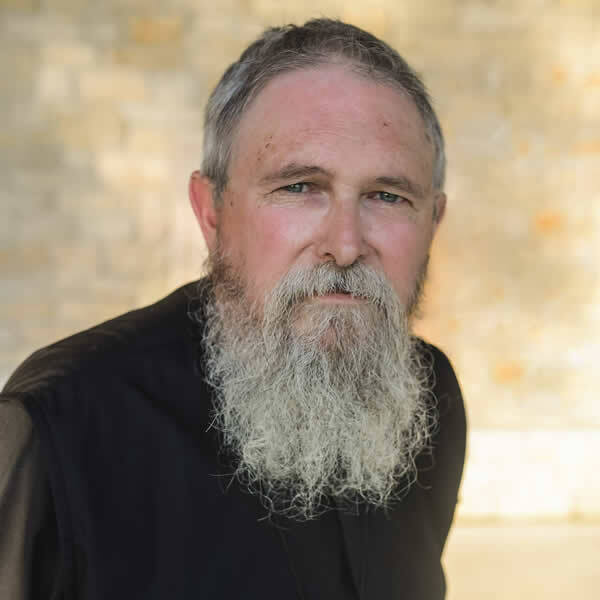 Thank you Father Stephen…you never cease to amaze me! When I look for pictures, I sometimes have something in mind, but I also type in the articles headline and use google photos. The suggestions are quite interesting. I wind up playing around for ten or fifteen minutes until something comes up that seems to work. This time, it was about dead men’s bones. These bones, of course, are not the bones of the pharisees. However, I think such displays created such a sober atmosphere that no one could boast of their morality in their presence. My wife said it was “maccabre.” Indeed. Well, IMO you couldn’t have picked a better picture! As for maccabre…it is an interesting phenomenon how we shrink in this type of presence and at the same time are mysteriously drawn to it. Just a thought…don’t mean to get off topic. Thank you again, Father. I go to a nursing home each week to visit a parishioner. It has many patients who are in slow decline. I’ve done this kind of thing for over 30 years. I also spent 2 years as a hospice chaplain, and had one parish out of which I buried around 120 people. All in all, I’ve been present at many deaths, and spent a lot of time with people in their dying days. It exposes you to some of the greatest weaknesses that human beings experience in our culture. I have to say that many of my thoughts on this topic are informed by that experience. It’s not macabre – but it’s very real. Too many people are shielded from these realities. Yes, Father…our greatest weaknesses. I will keep that in mind as I read your articles on humility, shame, suffering and the like. You, as a Priest, are with a person at the most important moment of their existence…that crossing over, so to speak. Over all those years, I can only imagine the peace you have given to them and the lessons you learned from them. Thank you for offering to us what has been formed in you. Be blessed, Father. To be honest – it is a very uneven experience. Dying has almost always been more about its physical aspects than about its mental or emotional. Those things can slip away overnight and without warning. I do have some very treasured stories, particularly from WWII veterans whom I had the privilege of serving. Towards the end of life, stories that had never been shared were recalled. Harrowing, but real. A man who was in the infantry at Bastogne recalled the day the weather broke and air support was able to resupply the 101st. They were surrounded by the German army at the height of the Battle of the Bulge. He told me about having no food, and only 3 rounds left in his carbine. When the air drop brought food and ammunition, he said, “No one went for the food.” It was a poignant recollection from a quiet hero, one of so many who simply did what had to be done to survive and hold a position. Their courage saved the day. I remember others as well. I understand what you are saying, Father. Although there is naturally a mental/emotional component, the person is acutely aware of their body shutting down…I believe this is what you meant by those “greatest weaknesses”. This may sound kind of ridiculous that I didn’t mention this before, but I am a retired RN, worked ICU for a number of years. Sad to say though, because the nurse is responsible for all the “externals”… meds, the equipment/machines, to notify the doctors, family members, documenting…there is little time to remain at the bedside to help the patient through the actual dying process. That is why I know your presence as a Priest is so very important for that person, to bless them, comfort them, listen to them, or simply sit with them. The story that the WWII veteran shared with you only…very touching. No doubt you’ve heard more than a few of those, in the hospice and as a chaplain. What a blessing. I had a trying week, one thing and another. Most of the trials being in my head (what other trials really bother us?). But kind words and encouragement – people sharing their own experience and insight – our common life in Christ. You are very dear to me. I pray God’s blessing on us all. My Archbishop visits this weekend – I will likely have little time over the next few days. Keep us in your prayers! May God comfort you Father. Blessings to you, your Archbishop and your Church. Thank you for your prayers. You have ours as well. Thank you so much for your writings, Fr Stephen. You’ve blessed me more than I can say. Once again, thanks for this beautiful essay! Your writings on the theme of Morality are my favourties among all your blog posts! I realize you are going to be very busy these next few days preparing for the visit of your Archbishop. I pray that all goes smoothly. Also, when I see any of my peers (like the banker you mention) who have successfully attained the goals which they had planned to reach (academic, career, economic, etc. ), I am again tempted to think, “That person planned well, and something was lacking in my planning or execution.” Then I would “try harder” and after a few months find myself in the same rut, once again wondering what went wrong this time. After all, the accepted definition of “virtue” in several catechisms is “A habitual and firm disposition to do the good.” This makes it look like a skill that one should be able to acquire with a sound strategy and enough practice – sort of like driving a car or swimming. But I learnt with great pain that some other mysterious factors are at work in reality frustrating the best laid plans. The self-development mindset definitely doesn’t take into account the concupiscence of man. But after reading your blog (and the highly enlightening comments of your readers below every article) for the past few years, I have begun to wonder if what Fr. Surionau meant after all was something more like, “Try to come to a deeper realization of your brokenness each day, keep praying and repenting, and God will sanctify you on his time-table, but in this world, you may never be aware of how deeply his sanctifying grace is at work in you.” Have I got this right? I also recall Jacques Maritain saying in one of his books on the history of Philosophy that several philosophies in the history of the world have set before man Eudaemonia as the sole ideal and this has often discouraged the followers of those philosophies from aiming for Beatitude. Would you agree with this? If the one thing we are guaranteed to receive the grace to do well in life is to realize our brokenness and repent, why are we all not equally miserable? Why then is one man a successful banker and another almost always broke and whose business plans somehow always fail? Why do some people become academic successes and others burn out and drop out half way? Why are some able to tackle any challenge confidently while others are crippled with anxiety and depression? Is this completely the will of Providence for some hidden reason? Or could it be said that at least some of the people who are “failures” in life could have bettered their social position (which of course has no necessary bearing on their salvation) by better planning and more knowledge? Or am I doing something wrong by thinking about this and is this an inscrutable mystery that is not ours to probe? Once again, I thank you for all the tireless writing you do. Had I never stumbled upon your blog, I would have never given sufficient importance to sitting with my shame or accepting my brokenness. These have helped me very much over the past few years. I hope to learn much more from your writings. Thank you, these last two comments are some of the most beautiful, therapeutic for the soul and heartwarming words I have ever read on this blog… Simply amazing. Is there any singular philosophy in our history that does this to the extant that our modern, middle class, secularized philosophy and “morality” does? I don’t know of it. Our mission parish supports (if you can call it that – the money involved is minuscule) a local charity called “Showers of Grace” by purchasing a used crib about once a month. Run on a shoestring by a local evangelical family, this charity provides a baby shower for local poor and usually unwed mothers who forgo an abortion and have their child despite their very un-middle class circumstances. There are those on our parish board who would like to end our support because the charity is not Orthodox, and besides these women should not be having babies anyways – their behavior does not make sense and is not “reasonable”. Are we not “enabling” them in their poor choices they ask? Your essay and these comments “speak for themselves” those who have open hearts and open minds to reflect on the state of their own souls, do hear you and take your words to heart. And then they who truly hear you pray, Lord have mercy on my sinful self. I like the ‘bone picture’ too. I’m grateful for the reminder about what state my body will be in for the rest of the ages until the resurrection. And I also sense the presence of these people. Father, your writing on this subject and modernity has always been edifying for me. My grandparents knew nothing of modernity. My parents were well infected by it as a result of their country’s attempt at ‘modernization’. “An educated man can kill me (if he wants)” became a new proverb in the 1950s! Part of this modernity was the middle class spirit you speak of, as well as the conflation of morality with Love (God). Like Peter the Great in Copenhagen (or so I heard it said), Ethiopians today look at the politeness, neatness, efficiency, and general morality in the West and wonder if “they’re better than us”. Inspired, properly I hope, by your writing, I tell them nonsense – one can easily have morality without love. Morality can simply be a result of self love and a desire for reciprocity. After all, didn’t even Rome, clean and efficient Rome with a senate, give Christ a fairer chance than the Jews? Didn’t St Paul use the Romans’ ‘fairer’ system to live another day every time he was near death? The Romans were quite moral, but did not love Christ. Morality without Christ is nothing. Your writing, Father Stephen, has helped me slowly unravel the myths I unknowingly grew up with and accepted. A very encouraging note! I think those who grew up in the “third world” are particularly vulnerable to the myths of modernity when they emigrate. The message is that “your tradition stood in the way of progress.” The true story is so much more complex – rife with colonialism, and exploitation of the worst sort. All of the exploitation was easily justified by saying that others were “backwards, lazy, ignorant, etc.” There were so many lies strung together to form the larger lie of modernity itself. There is nothing wrong with technology in and of itself. Technology long predates modernity. It is the false mentality of modernity that now claims sole proprietorship of science, technology, etc. It’s pure mythology – with money and power as its motive. First I want to say thank you! You could have not talk to me any better. I have read most of your post for couple years. and this one was just directedly for me. I struggle with finding the true self identification and the one that we all have to fit to pleases and look a well behaved citizen. Every time when I get ready to take a part from the Eucharist I ask God to help me find myself and stand out from the crowd. I ask him to give me the wisdom to know my self so I can serve him better. Father I wish if I can say he did heard my prayers, but am still waiting. Thank you Father for kind reminders. I have seen the tendency you mention, Fr., for people from the “Third World” to adopt modernity when they emigrate– and even within those countries, depending on how much Western influence exists there. It is a shame. I wish I could shield the world from the bad influences within Western culture, but I can’t even shield myself. And of course everyone has to have the opportunity to explore and adopt their own beliefs. It is difficult enough to address modernity from within Western cultures. Even though no matter our political, ideological, or religious backgrounds, all Westerners are pretty aware and critical of our own societies. Its kind of weird. Are you still going to Athos? Yes. We leave the last week in September come back at the end of the first week in October. I’m in a group of 10. My son and a parishioner make the three of us from my parish. There are several other priests and laymen. I have much more appreciation for you wisdom than I do for the moral-ism of your detractors. People always assume that the church’s primary business is to teach morality. But it isn’t; it’s to proclaim grace, forgiveness, and the free party for all. It’s to announce the reconciling relationship of God to everybody and to invite them simply to believe it and celebrate it. Morality, law, rules, prescriptions – those are all the world’s business. And the world keeps up a steady drumbeat on those subjects: you must do this; you mustn’t do that; you’re out until you can prove yourself worthy of being let in. But that’s just a thinly disguised way of saying that most people aren’t going to be in for very long and that none of them can be in for good. Nobody, from Adam to the last person on earth, can pass a test like that. And therefore God simply doesn’t risk it: by the Mystery of the Incarnation, he cancels all the tests and gives a blanket hundred percent to everyone. In the Mystery of Christ’s death, he drops all the rotten works in the world down the black hole of his own forgetting; and in the Mystery of Christ’s resurrection, he makes a new world in which we’re all home free. I hope you will blog about Athos and take whatever pictures they allow. Cribs of silver and gold as icons on Christ’s love…brings me to tears and pierces my heart! This is so beautiful! On Transfiguration Sunday 2 weeks ago my husband and I decided to formally become catechumens in the Orthodox Church. Two days ago we were received with those incredible prayers prayed over us by our priest. Just a couple hours after we finally decided, however, one of the most influential members to us of our church fell asleep in the Lord. I feel such sorrow at not sitting down with him to share such wonderful news. Instead we were introduced intimately to how the Orthodox walk through death. We attended every single service and the burial. I am struck by the depth, beauty, communion with each other, the worship. It seems fitting to begin the formal leg of our journey into Orthodoxy in this way. Your writing has helped me immensely make the transition from Protestant to ex Protestant to one longing for Orthodoxy. The shifts of thought and being are so total and difficult; I will feel new to this for years to come. I have a sense that I will be a complete failure as an Orthodox person. I am undisciplined, struggle so much with loving others (oh my poor children and husband…), get screwy in my thinking….but I take hope because isn’t it someone just like me who so desperately needs Christ and His church? I do not like this awkward feeling but it’s not my comfort God is most interested in, is it? I am delighted by your connection between Zacchaeus and Jesus as fools on trees. I’d never seen it that way! And my deepest thanks for your writing and the generosity you have encouraged in the community on this blog. You all have challenged me and soothed my soul many times. And blessings to you and your family, Kristin. This blog is indeed a wonderful support for those of us just beginning our lives in the faith. I too, am grateful for Fr Stephen and the helpful comments of the other commentators. I read this blog pretty much on a daily basis. It seems to help me ‘stay grounded in the life’. Blessed journey to you and your husband. I feel both your joy and trepidation. May you be encouraged by the love of Christ and all His people! What Marmion offers us in Christ, the Life of the Soul is a practical road to holiness. He points out this road with a sure and steady hand. He has no time for those who wish to travel on their own, and who base their journeying on purely human ideas. For such people, he says, “their life becomes a toil, subject to incessant difficulty, a toil without an opening-up to full flower.” He often told the story about his own spiritual director in Clonliffe College, Dublin, who maintained that there was only one road to holiness: Practice the virtues, and keep on practicing them, until in the end – after many long years – you come to love God. Marmion had no sympathy with such an approach, which, he said, was in fact difficult and impossible. He proposed a more God centered way: ” Begin by loving God, and in time – very soon, in fact you will be led to practice and relish the virtues.” Speaking from his own experience, he maintained that this way was easy and agreeable. Forgive me, Fr. Steven, for pressing here. I’ve been in an inner war zone between self-examination that devolves into navel-gazing inaction and indignation that rages against those who would label me and my family inferior (I am a white man married to a black woman, and we have a child; as you can imagine, this is an incredibly distressing climate). My concern is that, by identifying our own sins that we see in others, we fail to speak up for the oppressed out of a sense of, “well, I’m no better than the worst; I’m the chief of sinners, so what can I say?” Wouldn’t that perpetuate our sin? Wouldn’t we become complicit by not doing anything? By not taking a stand? Maybe this is the wrong conclusion to draw from the post, but that’s how I’ve always interpreted it. Help me understand. I don’t mean labeling people as irredeemable (e.g. white supremacists), or myself as uncorrupted by hate – but there has to be another path. Active resistance against evil motivated by love and pressing for justice on behalf of our brethren. It is a privilege to remain inward-focused, and our silence on behalf of the voiceless (the oppressed in many forms) – is it not consent? I’m reminded of the church-goers in WWII Germany who sang their hymns louder to drown out the wails of Jews stuffed into boxcars and headed toward their doom. How do we navigate this? I live in the South where interracial couples and children are quite common – including in a very blue-collar Walmart town like Oak Ridge. They get no comment or notice that I see. I think most people (white) that I know would be aghast and angry if they heard any disparaging mark directed their way. That said…the atmosphere is indeed incredibly distressing. But the “atmosphere” is largely something created and maintained by mass media and social media. I have watched a tiny, tiny group of White Nationalists, etc., project themselves as a large dangerous mass movement – because it fits a narrative of alarm and concern that works with mass media and social media. I’m alarmed by them as well – and I’ve confronted some of them directly – (and been attacked in return) – but I’m mostly concerned for their souls and the darkness they are nurturing within. 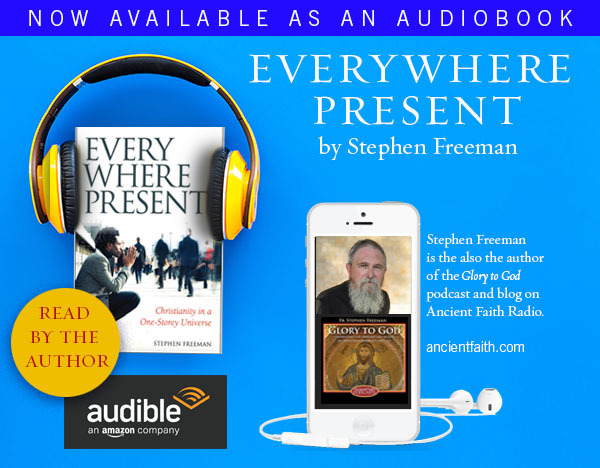 German Christians were not inner directed. They were numbing themselves, and mostly cooperating with Hitler’s propaganda. Had they been properly directed inwardly, they would not have cooperated – he would have found no traction. At present, we are a culture so trapped in its own passions they we are being carried about in a mutual dance of distruction. Actually, our adversary doesn’t really care what you think as long as you think it in a manner governed by the passions. We are given commandments as Christians. If we keep them, we will indeed do justice. But we should not mistake American justice for the justice of the Kingdom of God. So, keep the commandments. Sometimes it will get us killed. But do not lose your soul in these culture wars. The only righteousness that matters is that which comes by the grace of God. The righteousness of morality (including political morality) needs no grace – it will ultimately lead to death. David, you may find the following posts of interest in your search. Forgive me if you have read them already. Your words to me are like a compass always pointing to true north, or like an ice-cutter slicing through the frigid/danger- packed waters of our culture. “At present, we are a culture so trapped in its own passions that we are being carried about in a mutual dance of destruction.” My inner eye, though, must be focused on my heart. Outwardly, turmoil, inwardly peace. That’s why I can only read headlines. Having said that, there is still so much that is precious in our world, such as the greeting of my granddaughter this morning, her face aglow, running to hug me. Or the little 7 month baby with her grandmother at the market this a.m., her large brown oval eyes looking at me intently. Softness, goodness, innocence. Stark contrast to that riled by our passions. Lord have mercy, especially on these little ones. Bravo, father! Thank you for taking the time to respond, and with such wisdom. Especially the distinction between inner direction and numbness. That brings a lot of clarity for me. Byron, thanks – I’ll check those out! It seems so counterintuitive to the way we were approaching the gospel. We taught that one had to be of an age to make a choice before one could choose to be baptized. The whole thing had to be weighty, reasoned, and methodical. We had to memorize strings of proof texts to support certain views, both common to Protestants, and Sectarian only to ourselves. I have seen what the world has done to my beautiful baby, who is now a sullen teenager. The local Christian School I send her to, hammers on her with classes on current events, and the need to be a force in modern society – she must be a crusader or she’s a failure. It seems to me that much of Orthodoxy is in becoming a child once again. Loving the good, eschewing the bad, and living each day with the certainty that our father is looking out for us. I would have to disagree with a comment here that “the Church’s job is not to teach morality.” Can you clarify for us? The way I understand it is, the problem is not in teaching what God wants for our lives, what behavior is good and right, it is in HOW we go about it, and our underlying motivation in living a moral life. Throughout scripture God has instructed His people what is good and right and true. We see what behavior is inappropriate in the Old Testament and throughout the New Testament as explained by the Apostles. If the Church does not share the morality God has for us, for our good, to become closer to Him, then people will get their values from the world. The key is sharing the Truth in love, not in a judgmental way. There is a difference between being discerning and stating when something is correct, and being judgmental. We share proper behavior in humility, sharing the good paths, with the testimony that we too have gone down wrong paths, and the damage it has done, that God has better things for us as children made in His image. Moral behavior is required of God’s people, as a nation set apart, with the proper motivation…that motivation is to be transformed not only outwardly (outside is clean, inside dirty/white washed sepulchers) but inwardly by love for the Trinity and our Lord. To clarify, it was in the comment section. As always, just engaging in discussion and thought, looking for the Orthodox thought and teaching.